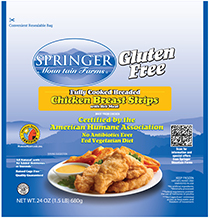 Springer Mountain Farms Fully Cooked, Gluten Free, Breaded Breast Strips are a rarity! Fully Cooked, delicious, and also gluten free! Perfect to enjoy with a salad, in a wrap or just by themselves. 3. Place frozen chicken breast strips on baking sheet; arrange pieces 1 inch apart in a single layer. 4. Bake 20 minutes or until golden brown. Turn the product over half way through the heating process. 1. Place 2 frozen chicken breast strips on a plate. 2. Cover with paper towel.